Combine the salsa and chicken broth in a medium size bowl, cover with plastic wrap and microwave for 90 seconds. Remove bowl carefully, pull back plastic, and stir in the couscous, and replace plastic wrap. Set aside. Lay the chicken tenders out on a plate and sprinkle with the spice rub and about ½ teaspoon of the salt. If you like things spicy, you can use more rub, or just sprinkle very lightly if you like it more mild. Heat about a tablespoon of olive oil in a wide saute pan, and over medium heat, cook the chicken turning to brown all sides. When the chicken is cooked through, squeeze the juice from ½ of the lime over top, place the chicken on a plate and set aside. Add another tablespoon of olive oil to the hot pan, and add the peppers and onions. Sprinkle lightly with the remaining salt, and saute over medium heat until tender-crisp. 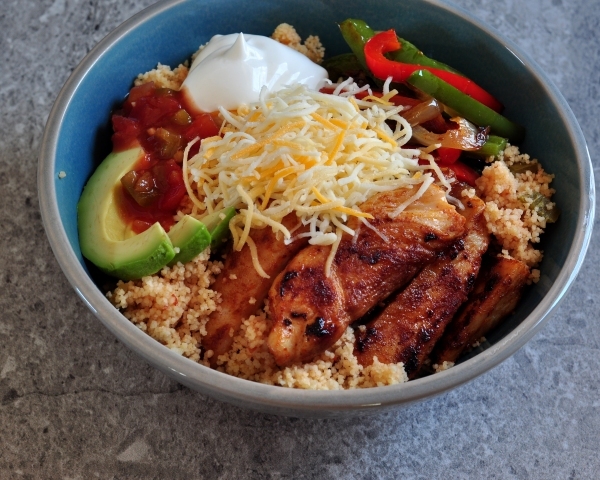 To assemble the bowls, layer the couscous in the bottom, sprinkle generously with cheese, top with some of the chicken tenders and the sauteed peppers and onions. Serve with the additional salsa, sour cream, hot sauce, avocado, and lime wedges.